Polypropylene or polypropylene (PP Chips) is a thermoplastic polymer, used in a wide variety of applications, including plastic parts and reusable containers of various types, thermal paints and shirts made for the military, laboratory equipment, loudspeakers, automotive components, and polymer banknotes. It has been found that mechanical recycling is the best recovery option for large PP automotive components, while energy recovery is the solution for most small plastic parts. Polypropylene’s are available to meet the needs of various fabrication processes such as extrusion, injection molding, thermoforming, blow molding, biaxial oriented film (BOPP), fiber spinning, slit tape, extrusion coating, and laminating. 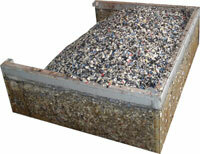 In this Lead Acid Battery Recycling business, Polypropylene acts as a hidden advantage. This is because it comes out in form of by product which is sold out at good prices to PP recyclers.